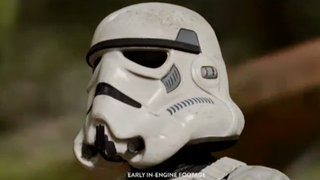 EA only showed a few slivers of gameplay footage from their upcoming Stars Wars game. But, damn if it doesn't make you want to get on a speeder bike on Endor. The Star Wars: Battlefront segment that opened EA's press conference was meant to convince people that they're taking the responsibility of making Star Wars games very seriously. It's a decent show of good faith but the prospect of waiting a whole year to even just see more is a daunting prospect.